A few months ago I combined web logs for the sites I run (not just this blog!) with a database of web browser 'user agent strings' I maintain to give some indication of the popularity of various mobile phone platforms. I now have a database of over 3 million page views covering an 8-month period. Together with my growing categorised database of over 69,000 web browsers gives an interesting if not too scientific* overview of the market. 1. Mobile traffic share: where's the Android surge?! 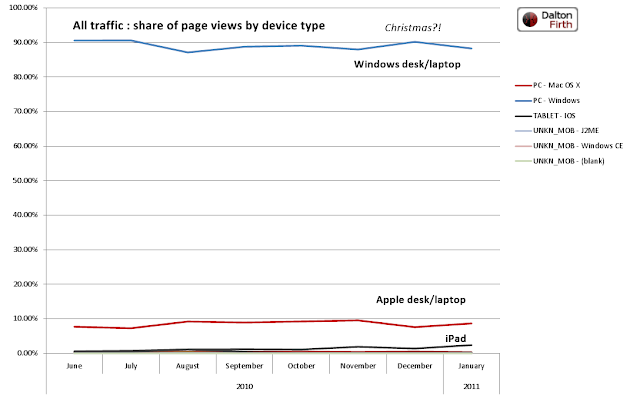 The slow rise in iPad use is to be expected here. The key surprise is the Apple desk and laptop share dropping away again. It looked like it was set to continue the rise seen June-September, especially given Apple's recent Stellar Quarter. 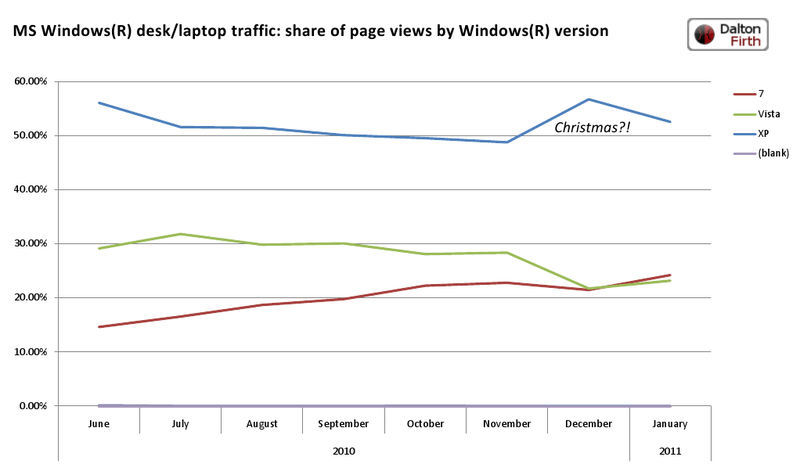 Another quirk is seeing Windows take a temporary chunk out of Apple over December. 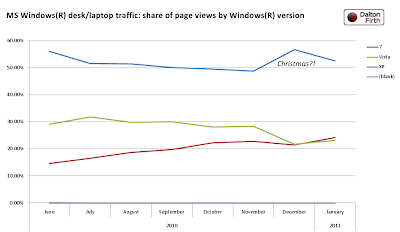 Does this indicate that fewer home users have Macs, therefore we see a surge in Windows use when everyone's at home for Christmas? 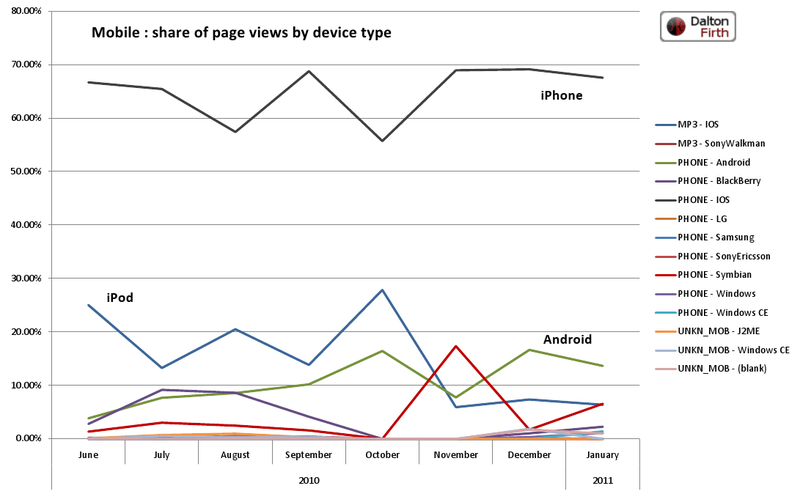 Another surprise is the non-show for mobile traffic share. Judging by what others are saying I'd expected to see mobile traffic start to appear above the noise. Oh, and Android tablets?! I'm seeing a spattering, but not enough to make the chart. 3. Windows traffic by version: XP just won't die! But Windows XP just won't die. There's maybe a hint of a decline between June and November, but then yet another strange Christmas effect. And I can't explain this one away as a home/office split - surely we'd expect XP to lurk in the office where some IT support staff are reportedly still reluctant to roll-out Windows 7. Or are they? 4.Bots and crawlers - don't be fooled by your site's hit counter! Web crawlers and robots accounted for a whopping 16.9% of all traffic. That's over half a million visits. 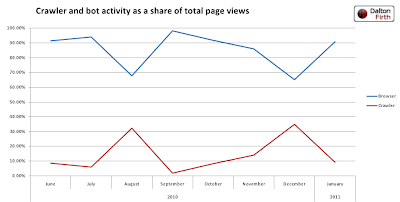 Not sure what the chart tells us about spikes of the traffic share in August and December. 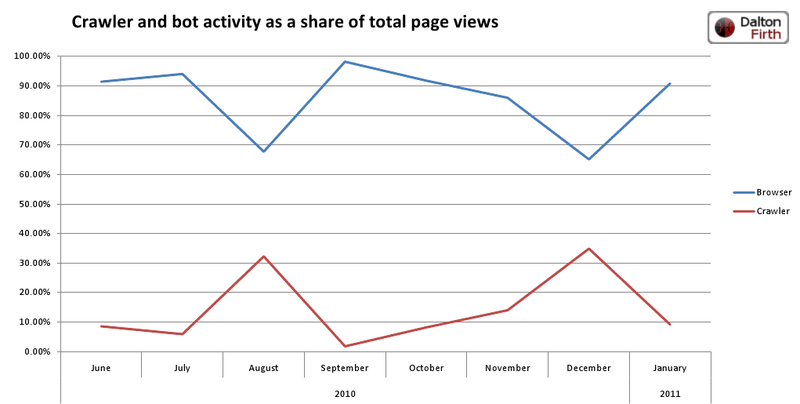 The content of my sites didn't refresh much over the summer, but there was a big refresh in December. On the subject of fooling yourself on the number of real visits to any given site, I happened to do a few experiments with links posted on Twitter over this period. I found a floor of 20-30 bots visited each link posted. And this value was pretty much independent of the follower count. So if you post your latest blog on Twitter and see a flurry of page views, say 25... I'm sorry to report that it's highly likely they're all crawlers. On my own blog I've found it takes a fair few hours and a handful of helpful retweets before the "real" visitors (those with recognised web browser user agent strings) overtakes the bot count. That's all for this quarter - I plan to post an update in 3 months.